RUMOR: Skies of Arcadia HD Coming Soon? Buzz has been building on the internet as word of renewal of the Skies of Arcadia trademark appeared on NeoGAF. The renewal of the trademark is fueling speculation of an HD remake for the Sega property, which has a number of Operation Rainfall staff members excited. This speculation is logical as Sega has HD remakes of Jet Set Radio (September 18th), NiGHTS into DREAMS… (Fall 2012), and Sonic Adventure 2 (Fall 2012) set for the PlayStation Network and Xbox Live Arcade. 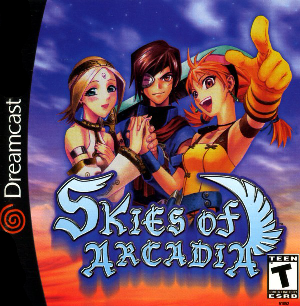 Skies of Arcadia is a role-playing game originally developed for the Dreamcast by Overworks in 2000. The game focuses on Vyse and his friends as they attempt to stop the Valuan Empire from reviving ancient weapons that could destroy a fantasy world inspired by the works of Jules Verne. The game also received an “enhanced” port to the Nintendo GameCube two years later, renamed Skies of Arcadia Legends. If you’re looking for a copy of the game right now, you may need to fork over a bit of money. Currently, the lowest price on Amazon is around $30 for a copy of the Dreamcast game. If you’re lucky, you might be able to find one of the last few GameCube copies at your local GameStop (going for $19.99) or maybe find a version at a retro gaming store near you. Either way, Skies of Arcadia (HD or not) is one game that we at Operation Rainfall will give our seal of approval for.